This is the most frequent type of living organ donation. All living kidney donors experience a decrease in their kidney function, which varies depending on the donor’s age and medical history. Learn how your kidneys work and about kidney disease. Individuals can donate a segment of the liver, which has the ability to regenerate and regain full function. Learn how your liver works. Although lung lobes do not regenerate, in rare cases individuals can donate a lobe of one lung. Learn how your lungs work. Although very rare, it is possible to donate a portion of your intestine. Learn how your intestines work. In extremely rare circumstances, individuals can donate a portion of the pancreas. Learn how your pancreas works. A domino transplant makes some heart-lung recipients living heart donors. When a patient receives a heart-lung “bloc” from a deceased donor, his or her healthy heart may be given to an individual waiting for a heart transplant. Extremely rare, this procedure is used when physicians determine that the deceased donor lungs will function best if they are used in conjunction with the deceased donor heart. Learn how your heart works. A few living donor uterus transplants have been performed as part of clinical trials. United Network for Organ Sharing (UNOS) is committed to providing accurate and reliable information for transplant patients. The content on this page was originally created on February 25, 2005 by UNOS and last modified on April 7, 2009. This website is intended solely for the purpose of electronically providing the public with general health-related information and convenient access to the data resources. UNOS is not affiliated with any one product nor does UNOS assume responsibility for any error, omissions or other discrepancies. Learn about who can become a living donor, the risks, and how you can start the process in this brochure. If you are considering living donation, it’s important to know the facts. 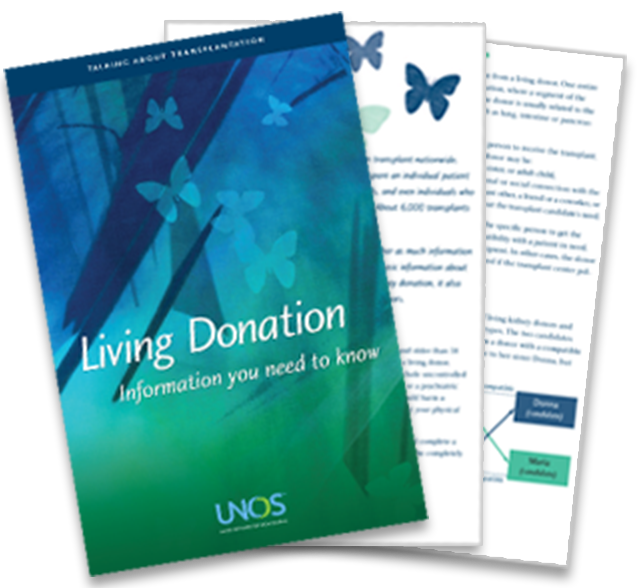 There are many different types of living donation, and resources to help. For more information about living donation, speak with your transplant team to see if it is an option for you, and read the following brochure, which is an Adobe® Portable Document Format (PDF) file.